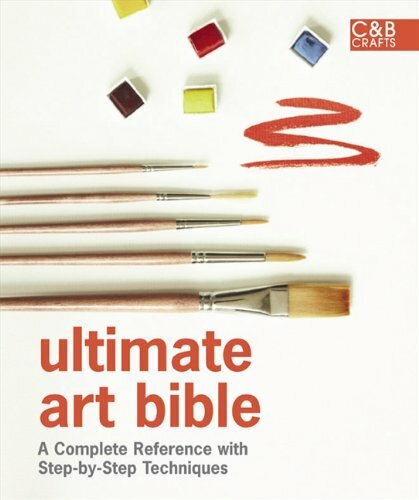 The Ultimate Art Bible is a introductory guide for beginners looking to create their own art. It assumes the reader has no prior knowledge to any materials or skills and hence adopts a simple step-by-step method of teaching throughout. The first chapter introduces the different tools and materials. It talks about the concepts needed when working with whatever medium you choose. Basic foundation art techniques are taught here, such as observational skills, perspective, colour theory, composition and tonal values. The coverage is not comprehensive but enough to get any newcomer started. The next section covers essential techniques used for drawing, watercolour, and oils and acrylic. These are specific to the medium. There are several tutorials that guide you along step by step. Instructions are concise and easy to follow. The illustrated examples used throughout look great too. There are several contributing artists, such as Ian Sidaway and Abigail Edgar who painted the majority of projects in the book. But the tutorials aren't credited individually so it's impossible to know who created what. The last section are based around popular drawing subjects, namely still life, landscapes and portraits. There are more specific techniques to these subjects taught here. Overall, Ultimate Art Bible is a good art primer for beginners and artists who might want to go out of their comfort zone and try something different. I use mainly ink and watercolour for drawing. After reading and seeing some of the other mediums and artworks, I'm quite tempted to explore other mediums for drawing as well.